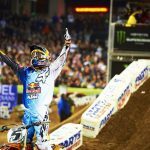 Arenacross, or Arenacrash as some prefer to call it, features exciting, close-quarter Supercross style racing in smaller, well-known arenas across the country. 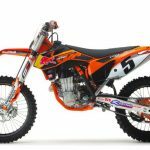 The 2018 season has just been announced by the AMA and racing kicks off January 6th in Fairborn, Ohio, at the Nutter Center. Get out there and watch some good ol’fashioned bar-banging! PICKERINGTON, OH – December 5, 2017 – Amateur racers have their chance to qualify to compete in the 2018 AMA Amateur National Arenacross Championship in Las Vegas on May 4-6, 2018, by competing in any of the 11 AMA amateur Arenacross racing events early in 2018. 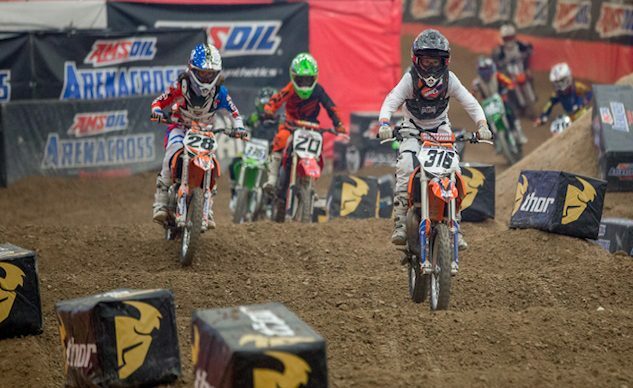 The qualifying events will take place across 11 states, where the top finishers at each event earn points toward their chance to compete in the AMA Amateur National Arenacross Championship in Las Vegas. The winner of each class at the final round in Las Vegas is awarded an AMA National No. 1 plate. The first round of the 11 qualifying events is scheduled for Jan. 6, 2018 at the Nutter Center in Fairborn, Ohio. 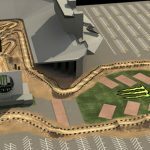 Arenacross racing features some of the most skilled amateur racers competing across the country on man-made tracks inside well-known arenas. 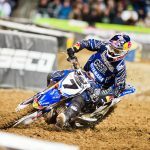 To register for AMA Arenacross events, visit www.axregistration.com. 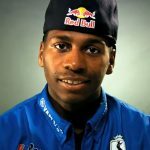 To learn more about AMA Arenacross racing, visit www.arenacross.com.